From the first day of having him as a teacher you could tell he was truly invested in helping us learn. He was excited about the things he got to teach us and often shared personal stories as well. From taking Intro into Higher Education, he helped us learn about what the field was all about. This really taught as how to work as professionals and some techniques to follow. Part of this class involved campus visits to other universities in our state. This was an interesting experience that let us see how other institutions student bodies acted and their institutional culture. Dr. Rice would also debrief with us about the experience we had at each institution. He would his add his input and give us things to think about. This class got us introduced to all the knowledge of higher education. Through taking his class called Management of Higher Education it helped us realize the difference between a manager and a leader. We learned how to keep a budget for departments, organizational structures, applications, evaluations and other supervisory strategies. Dr. Rice has had to do a lot of these things in his past positions as a dean and faculty member and shared his strategies about what he has done. This class was a great learning experience, where it had quite a bit of discussions of us sharing our ideas with each other. For the last class we had with Dr.Rice was the History of Higher Education, so we were able to learn about how higher education started. Each week he took us through a journey on what John Theiln had to say about how higher education started. He would often wore a sweatshirt from a different university and show us pictures from his journey there. Having him as a teacher has been an absolute delight. This week we honored him, in his last class as a professor. We all brought food to class and got him a nice blanket from our bookstore to remind him of us. Another way we tried to honor him was by all wearing different university shirts that we owned. This was one of his traditions that we thought he would love to see us do. 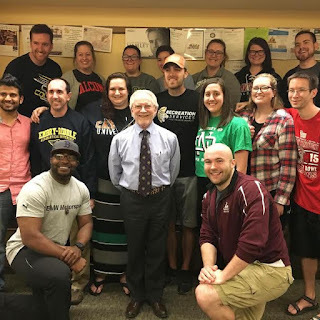 Having Dr. Rice as professor, was a great experience for my first year of graduate school. He had a wealth of knowledge that he was able to give to us each and every class. He was also a great teacher that watched loving us succeed in and out of the classroom. It will be a different experience not having him in class next year as we progress towards graduation.